After a super rocky start several weeks ago, involving a fair amount of hysteria, tears, and cajoling, I was pleased to take the above photo this morning of my new hero, Benji, laughing and splashing and swimming completely on his own. There are many things we've tried that have not worked out as planned (i.e. 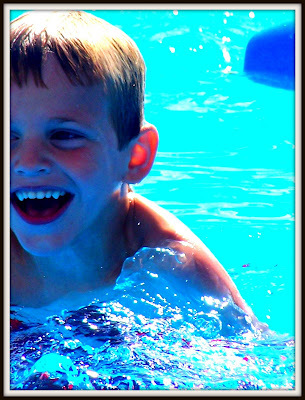 T-ball, gymnastics, even Boy Scouts) due to fading interest or logistical complications, but our all summer long swimming lessons were a big hit and I feel good knowing three out of four of my children could at least stay afloat without panicking if they were to suddenly fall into a large body of water. Ahh...the many rewards of parenting! That's fabulous! I know exactly how you feel. Just this morning I was at the pool (indoor, cos it's cold winter here in Oz) with my 3 girls, watching them do things that even just a month ago they couldn't do. So very rewarding for everyone involved. Priceless in fact. Today my 5-year-old got a chocolate bar from dad, a shameless bribe to get her to put her head under the water. Gosh he looks like Troy! At least from the photos I've seen. Don't give up on the Boy Scouts. Give them another opportunity. Your son will be able to swim at summer camp and "do" things in life he would not normally be able to do just with the family including team sports and camping in the extreme. Rock climbing, repelling, geocaching, earning his Eastern Orthodox religious award to name just a few. Thank you so much for the Boy Scouts link and for the encouragement to give scouting another try! I will definitely look into it this fall!